While the hefty price tag makes 2012 Panini National Treasures Baseball a tough sell for some, few will deny that the release has some truly compelling content. The sheer number of superstars and Hall of Famers with autographs is impressive. So too is the number of baseball's early pioneers who have memorabilia cards in the set, many of whom are very rare in the hobby. With boxes running several hundred dollars, this is Panini's priciest baseball product yet. For the price, collectors are going to find eight hits per box including one book card an on-card autograph. With a huge checklist, individual cards all come with low numbering. None are higher than 99. Another highlight in 2012 Panini National Treasures Baseball is the use of varied memorabilia pieces. Buttons, bat knobs and laundry tags have all been used before, but they're much more extensive here. The same can be said for the plentiful jumbo jersey pieces and patches. It's a reflection of the set's high-end nature. Like anything high-end, there is a risk component that should be taken into consideration. Some hits are going to be better than others. But this is also a product that lends itself well to single card sales, particularly with player collectors. Savvy collectors should be able to find some strong cards and deals for their collections. 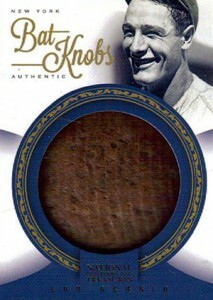 Below is a list of the 50 most-watched 2012 Panini National Treasures Baseball cards currently listed on eBay. It's a real-time reflection of what's piquing people's interest at this very moment.